The chori-pan consists of chorizo placed inside an un-toasted piece of baguette, mimicking some sort of sandwich. 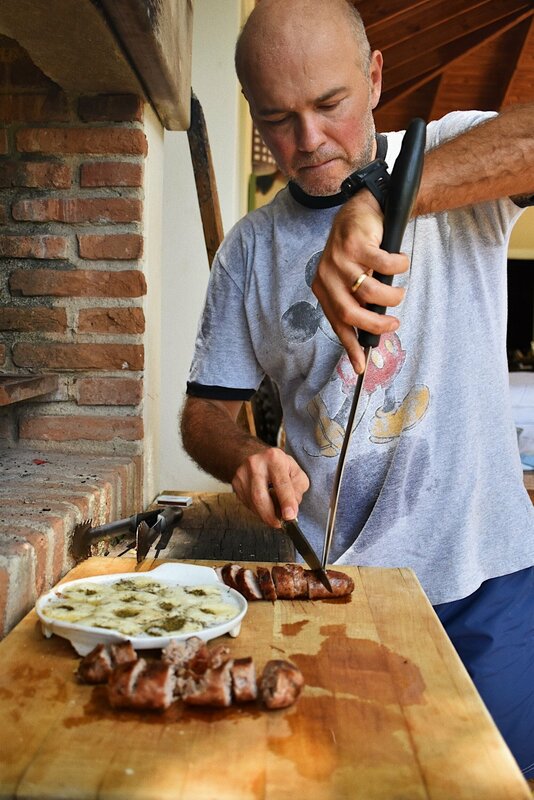 My dad gives it his own touch, toasting the baguette, and placing the chorizoon top. But for a signature Pablo Maglione chori-pan, top the chorizo with a freshly made provoleta, and let the grease of the cheese simmer into the meat. Tira de Asado is one of the most famous cuts in Argentina, and it consists of the meat closest to the animal’s ribs. It is one of my father’s favorites, and if prepared correctly I can achieve an intense flavor and an even greater texture, really something to be appreciated by the meat lovers. It’s a successful asado once you’ve gotten your hands and face dirty from a good piece of tira de asado. Melted provolone cheese with a sprinkle of oregano and usually a bad joke from my father. Made on a provoletera, a ceramic plate with embedded dents for each perfectly cut piece of cheese. A very simple dish usually served on top of a toasted piece of baguette. It’s impossible to have just one—I am constantly reminded to save some for my brother. Mollejas are strictly for the meat lovers. This piece of meat is taken from the throat of the animal, usually a calf. Mollejas terrified me as a child, and my mother –to my father’s disadvantage —did a good job at making sure I knew what I was eating. Now I beg my dad to include mollejasin every asado. Enhanced with lemon juice and salt, a good mollejais crunchy but juicy, with a side of my father’s pride, knowing he has perfected the dish yet again. A very well-known piece of meat, which is famous for the fact that you can only get one churrasco from every cow. It’s my personal favorite, for its crisp texture on the outside and its juiciness on the inside. My father calls this piece of meat the most “politically correct” because it contains enough fat for the meat lovers to appreciate, but at the same time it is thin and tender for the not so fanatics, like my mother, to eat without that big of a guilty conscience. By this point of the asado my father is drenched in sweat and we are all gathered around the table to devour the churrasco. 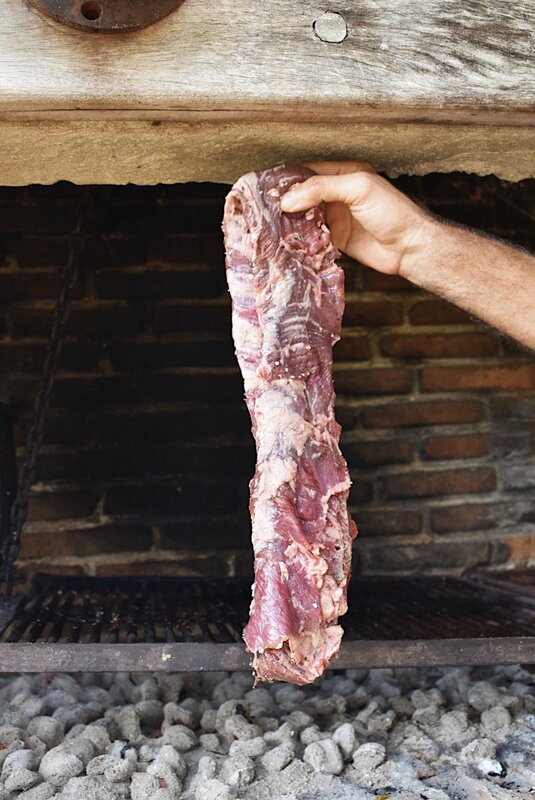 El asador is the most important part of the asado. My favorite of course is my father. My father was born in Buenos Aires, Argentina but has been living in the Dominican Republic for over 20 years now. He may have lost the thickness of his Argentinean accent, but his flavors still constantly remind us where he comes from. My sister and I joke around that his mid-life crisis is compulsive cooking, usually all Argentinean dishes. Every Sunday back home starts with my father opening up Francis Mallmann’s recipe book and choosing the challenge of the day. My dad is known among his friends in the DR for his famous asados, a man sharing his culture through every new piece of meat.